You’re probably already familiar with the input element’s type attribute. This is the attribute that determines what kind of form input will be presented to the user. If it is omitted—or in the case of new input types and older browsers, not understood—it still works; the input will default to type="text". This is the key that makes HTML5 forms usable today even if you’re still supporting older browsers. If you use a new input type, such as email or search, older browsers will simply present users with a standard text field. The difference between the text state and the search state is primarily stylistic: on platforms where search fields are distinguished from regular text fields, the search state might result in an appearance consistent with the platform’s search fields rather than appearing like a regular text field. Many browsers style search inputs in a manner consistent with the browser or the operating system’s search boxes. Currently, Chrome, Safari, Opera, and IE have added the ability to clear the input with the click of a mouse by providing an × icon once text is entered into the field, as shown in Figure 4.5. The date/time input types are also clearable in Chrome and Opera, and IE11 includes an × icon to clear most input types now, including inputs of type text. On Apple devices, the search field has rounded corners by default in Chrome, Safari, and Opera, matching the devices’ search field appearance. 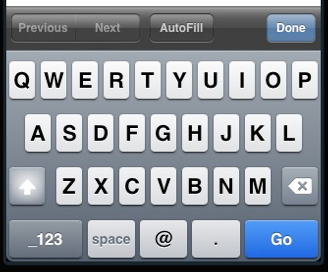 On touch pads with dynamic keyboards, the “go” button appears as a search icon or the word “search,” depending on the device. If you include the non-standard results attribute, Chrome and Opera will display a magnifying/looking glass icon within the form field. Since search, like all the new input types, appears as a regular text box in nonsupporting browsers, there’s no reason not to use it when appropriate. The email type (type="email") is, not surprisingly, used for specifying one or more email addresses. It supports the Boolean multiple attribute, allowing for multiple comma-separated (with optional space) email addresses. If you change the input type from text to email, as we’ve done here, you’ll notice no visible change in the user interface; the input still looks like a plain text field. However, there are differences behind the scenes. The change becomes apparent if you’re using a touchpad device. When you focus on the email field, most touchpad devices—such as the iPad or Android phone running Chromium—will all display a keyboard optimized for email entry, including the @ symbol, period, and space buttons, but no comma, as shown in Figure 4.6. Firefox, Chrome, Opera, and Internet Explorer 10 also provide error messaging for invalid email inputs: if you try to submit a form with content unrecognizable as one or more email addresses, the browser will tell you what’s wrong. The default error messages are shown in Figure 4.7. Unfortunately, while you can change the content of the message, you’re stuck with its appearance, at least for now. The url input (type="url") is used for specifying a web address. Much like email, it will appear as a normal text field. On many touch screens, the onscreen keyboard displayed will be optimized for web address entry, with a forward slash (/) and a “.com” shortcut key. All modern browsers starting with Internet Explorer 10 support the url input type, reporting the input as invalid if the value doesn’t begin with a protocol. Only the general protocol format of a URL is validated, so, for example, q://example.xyz will be considered valid, even though q:// isn’t a real protocol and .xyz isn’t a real top-level domain. If you want the value entered to conform to a more specific format, provide information in your label (or in a placeholder) to let your users know, and use the pattern attribute to ensure that it’s correct, as previously described. For telephone numbers, use the tel input type (type="tel"). Unlike the url and email types, the tel type doesn’t enforce a particular syntax or pattern. Letters and numbers—indeed, any characters other than new lines or carriage returns—are valid. There’s a good reason for this: all over the world, countries have valid phone numbers of various lengths and punctuation, so it would be impossible to specify a single format as standard. For example, in the USA, +1(415)555-1212 is just as well understood as 415.555.1212, but companies may also use letters in their phone number, such as (800)CALL-NOW. You can encourage a particular format by including a placeholder with the correct syntax, or a comment after the input with an example. Additionally, you can stipulate a format by using the pattern attribute. Include a title with the pattern attribute to provide for a tooltip and to improve the UX of the native validation error message. You can also use the setCustomValidity method to provide more informative client-side validation. In using the tel input type, dynamic touch pads will usually display the telephone keyboard, including the asterisk and pound key. You can use tel for more than just phone numbers. For example, it is likely to be the best keypad for social security number form entry.